“Do you want to eat your neighbour’s poo?” Children participating in a ‘triggering session’ are disgusted to hear how their food and drink can be contaminated as a result of open-defecation. 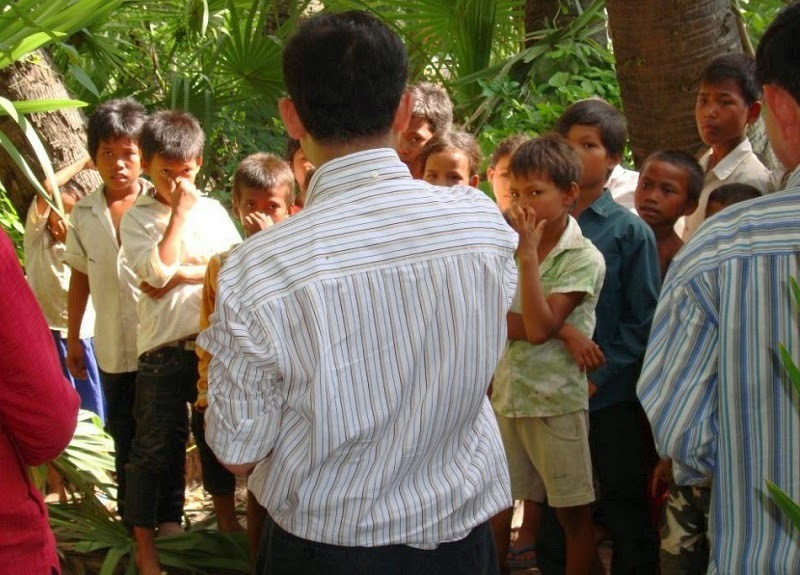 KAMPONG THOM, Cambodia, 25 March 2015 – “Do you want to eat your neighbour’s poo?” asks UNICEF WASH Specialist and facilitator, Heng Santepheap to a group of community members. Everyone looks at him in stunned silence as he puts a plate of rice on the floor next to a pile of human faeces. Soon flies are swarming around the food and faeces, flitting between the two. Nearby, a chicken steps into another pile of poo and then steps into a house. “This is what happens every day”, says Santepheap. “And it won’t stop unless everyone works together.” The villagers then find their voices and start chattering all at once, commenting on what they have seen. Rowena Campbell has worked with UNICEF UK and UNICEF Cambodia country office. She shares her experience of working ‘in the field’. 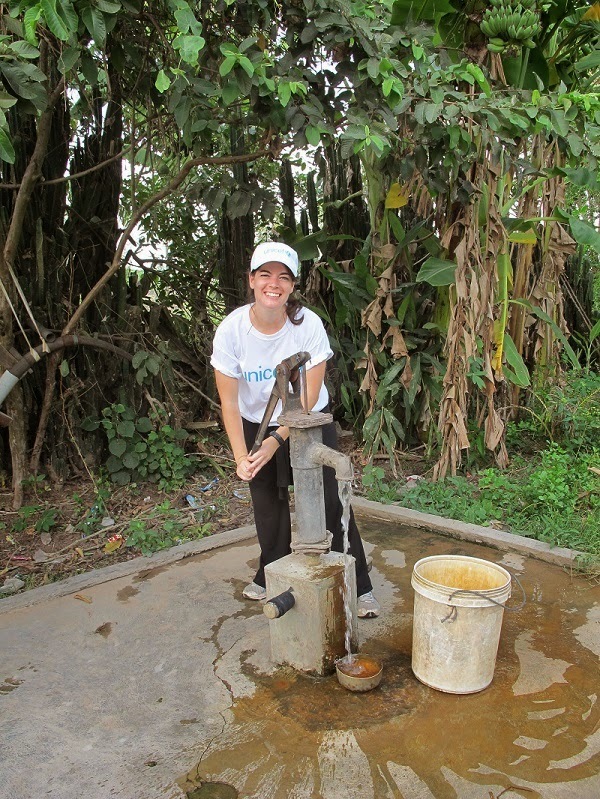 Pumping water in a community in Kratie province. PHNOM PENH, Camboida, 17 March 2015 - The welcoming smiles of my colleagues, the chatter and noise of the office, the patience and passion of my team, the rush and pace of the work; bouncing along dusty roads to the provinces, the UNICEF drivers pointing out everything and anything; my colleagues encouraging me to try every roadside delicacy going (the delicious and the downright terrifying); talking with strong, inspiring women, hearing their stories, writing their stories; photographing the beauty of Cambodia and the children of Cambodia, making every day count, in helping Cambodia’s children reach their full potential. SVAY RIENG, Cambodia, 10 March 2015 – Eleven-year-old Vattey* lives in a small bamboo home in Porthivong village, Svay Rieng province, Cambodia, taking care of her 33-year-old divorced mother, Kheum Channa*. Like many in the community, Vattey’s family has faced many challenges in life. Soon after giving birth to Vattey, Ms. Channa became disabled. With limited mobility, she was unable to continue work at the garment factory and when her husband also left her one year later, she found it difficult to provide her daughter with nutritious food. Despite these hardships, Vattey has big ambitions and wants to be a doctor. Mrs. Kheum Channa (right) at home with her daughter, Vattey. 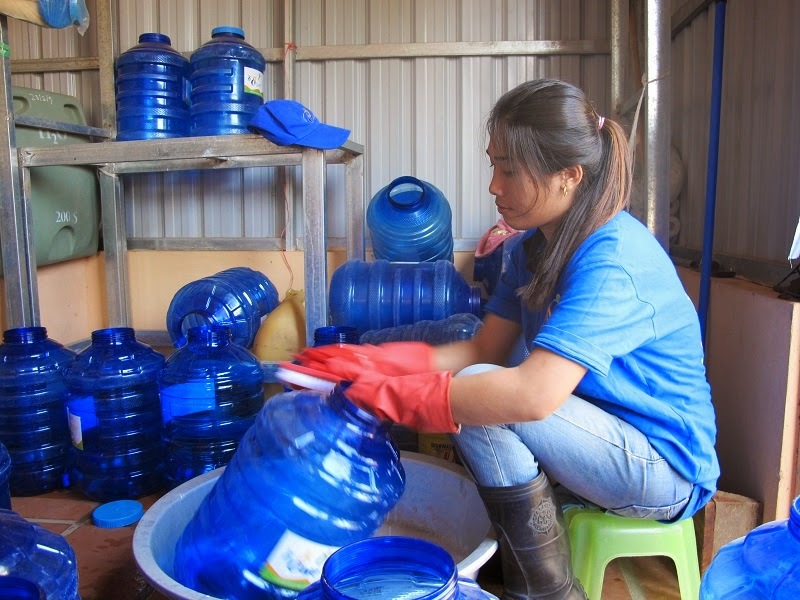 KAMPONG CHAM, Cambodia – 07 March, 2015 - Ly Nori is at work in the community drinking water treatment system. Crouched over used water tanks, she scrubs them with soap and bleach so that they can be re-filled with safe, clean, filtered water for delivery to customers within Vihear Thom commune in Kampong Cham province, about 138 kilometres north-east of the capital Phnom Penh. The 29-year-old has been running the system since it was installed six months ago by the local NGO, Teuk Saat 1001, UNICEF, and support from Japan AEON with Ms Ai Kawashima. Within the 11 communes in which Teuk Saat 1001 has installed community drinking water treatment systems Mrs Nori is the only female manager. Ly Nori cleans the used water tank with soap. This is the first step in cleaning the bottle, after this is it disinfected with chlorine, then rinsed out with fresh water.